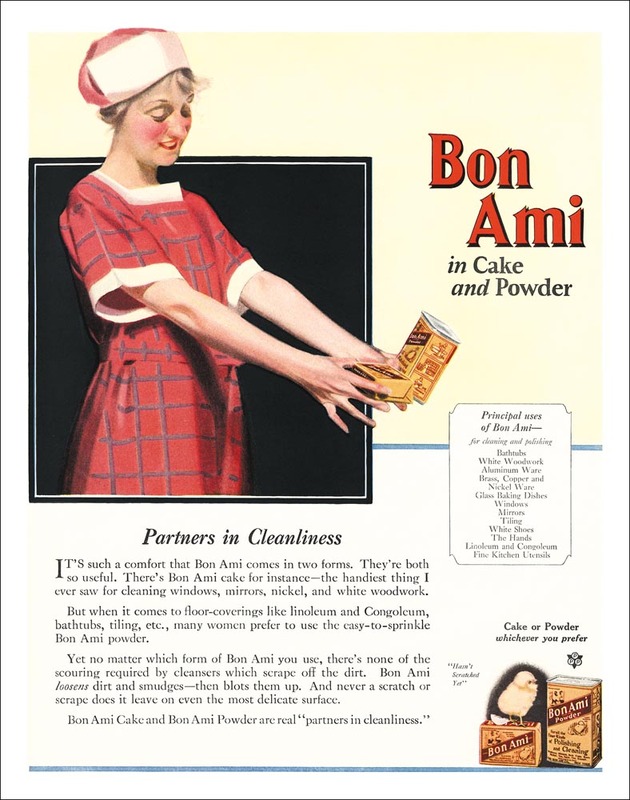 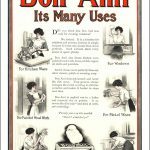 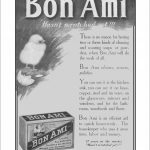 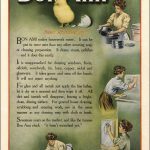 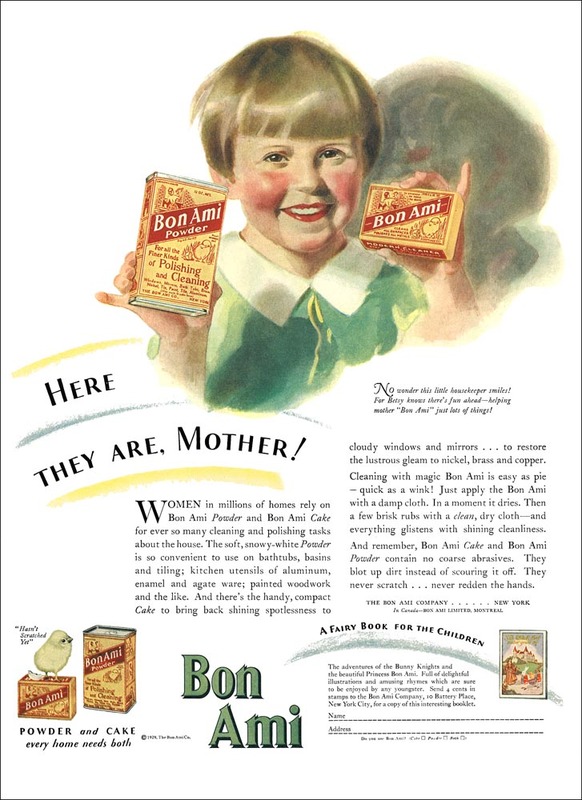 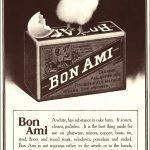 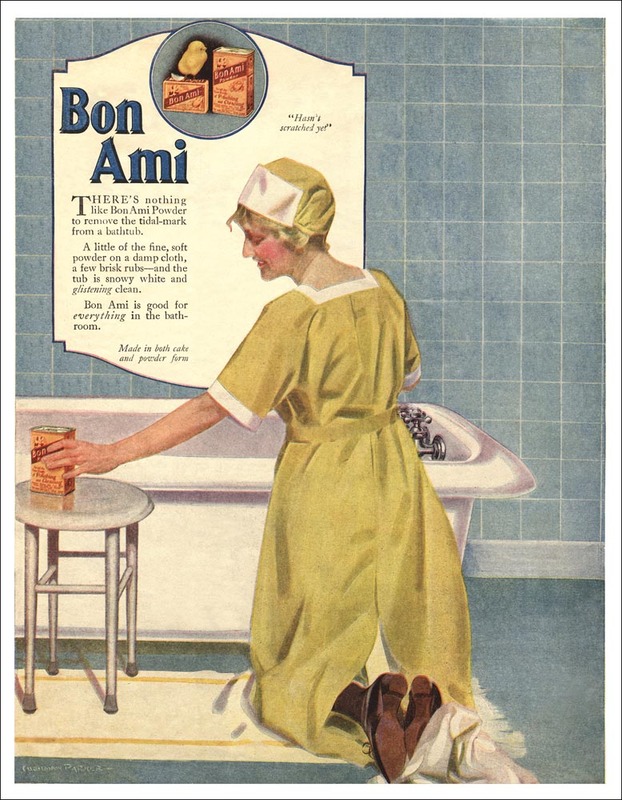 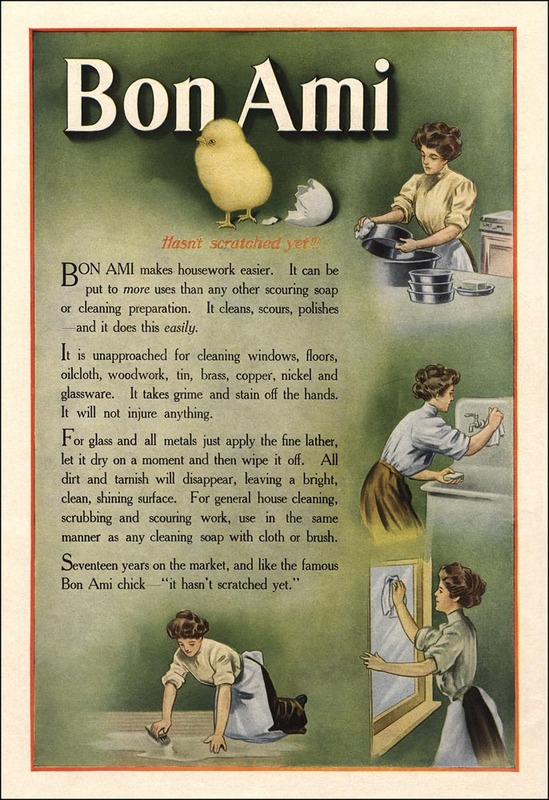 The artist who drew one of the first Bon Ami chicks (in 1903) was Ben Austrian (1870-1921), a fine art painter with studios in Paris, London, Palm Springs and beautiful Berks County Pennsylvania. 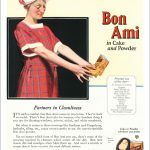 Famous and beautiful Berks County Pennsylvania. 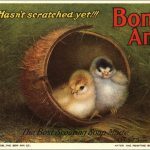 Famous for his realistic portrayals of barnyards and woodlands, we still think of him as the artistic hen that laid a golden egg! 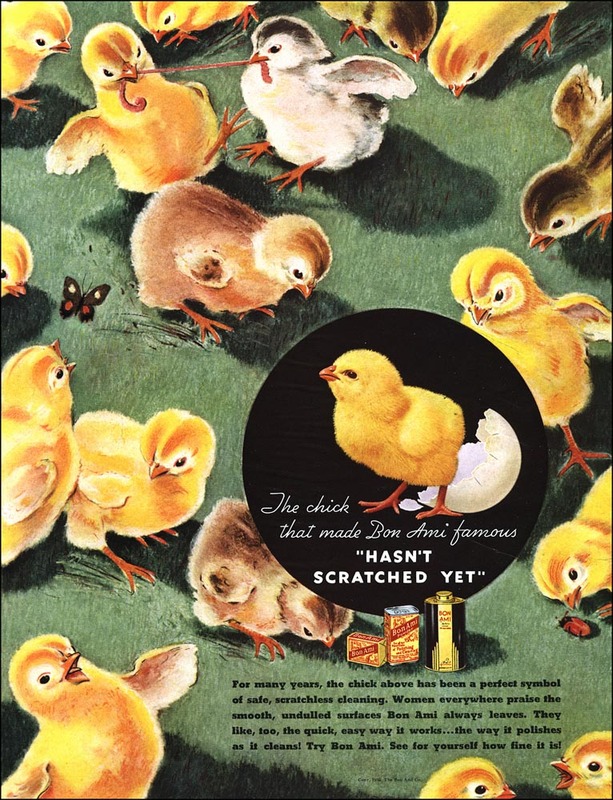 Though our chick remains minutes old, only a handful of company mascots are older. 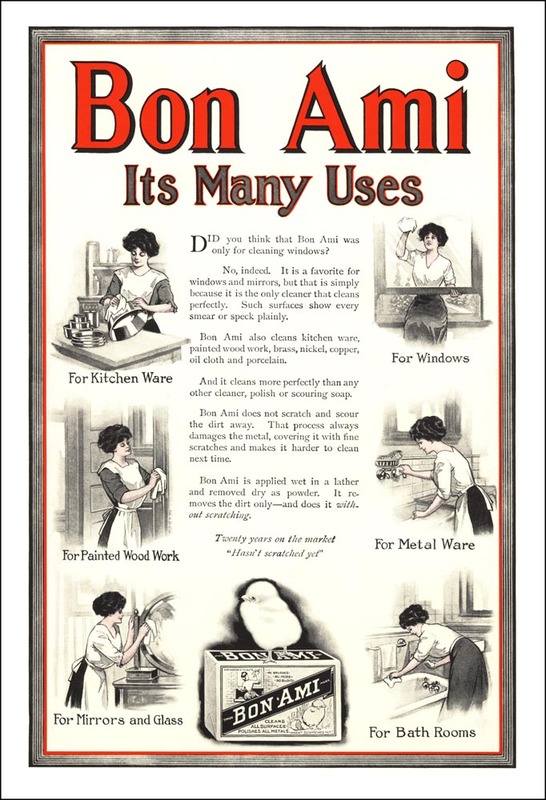 (She got her start in 1886.) 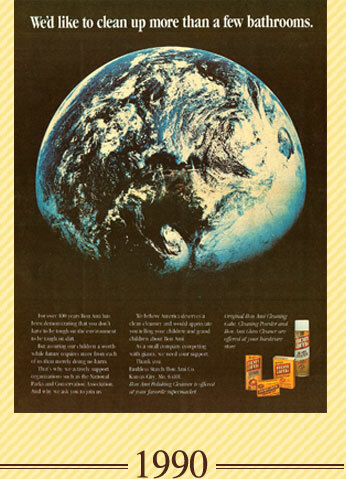 The man on the Quaker Oats box has been around longer, and so have the guys on the Smith Brothers cough drops. 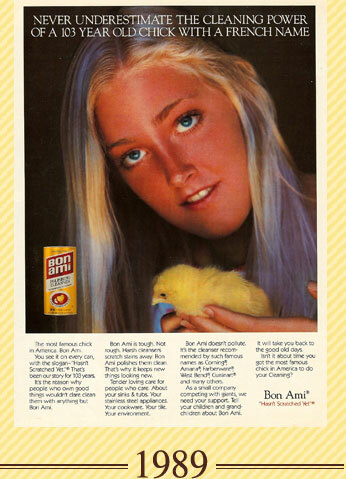 (And those guys all look old!) 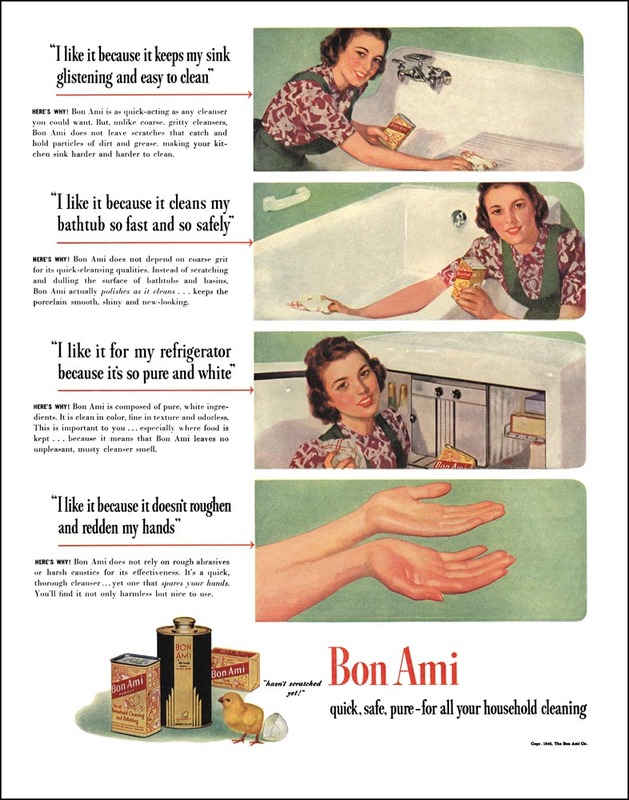 The arm and hammer on the baking power box (that’s the arm of Vulcan, if you’re wondering) are older as well. 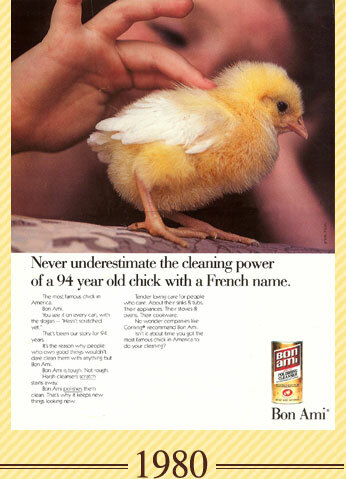 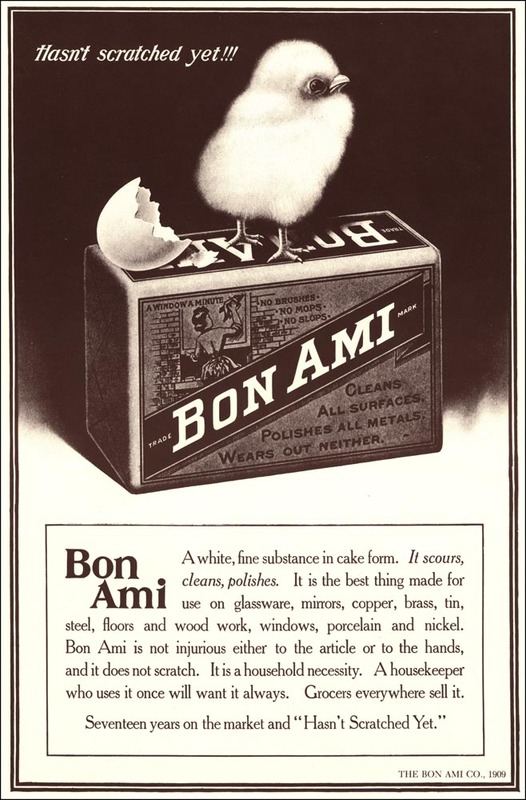 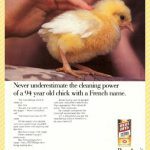 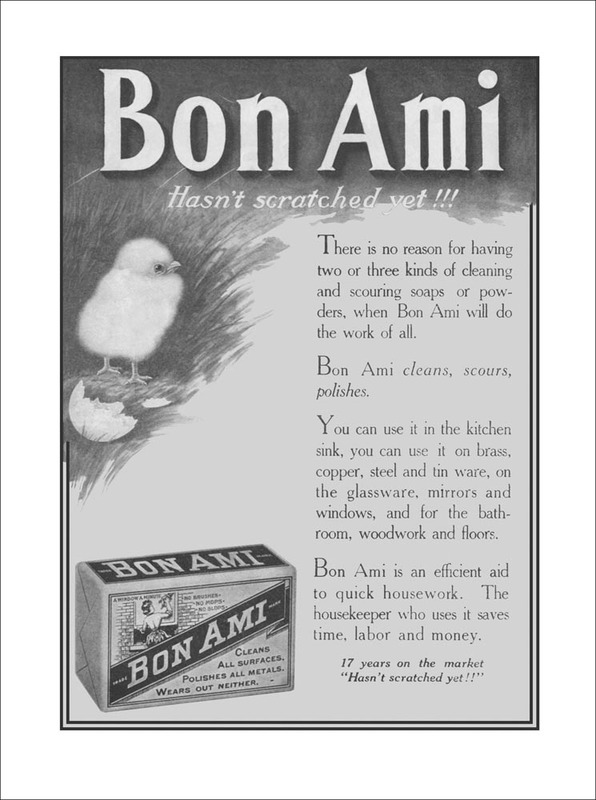 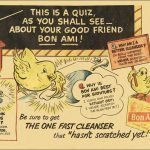 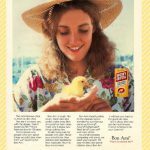 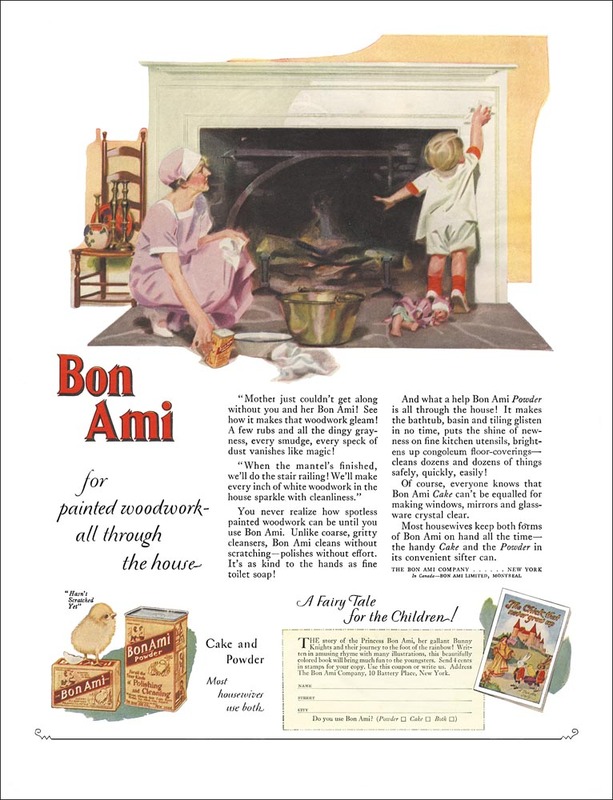 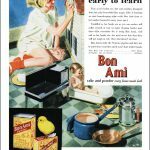 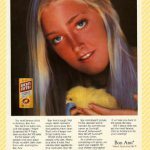 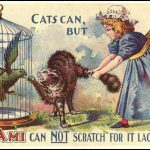 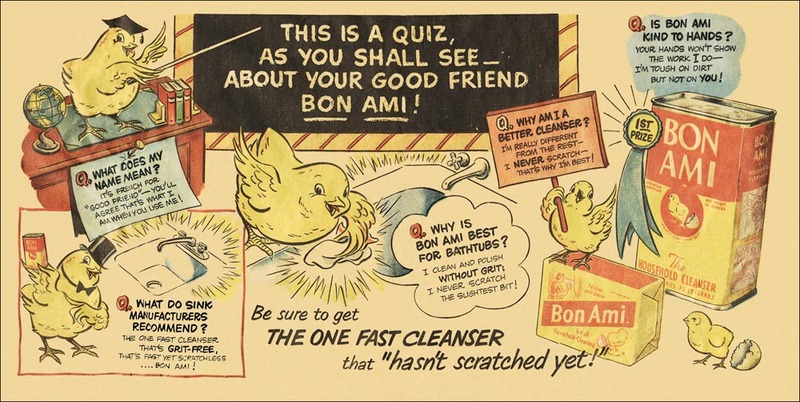 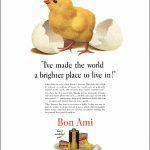 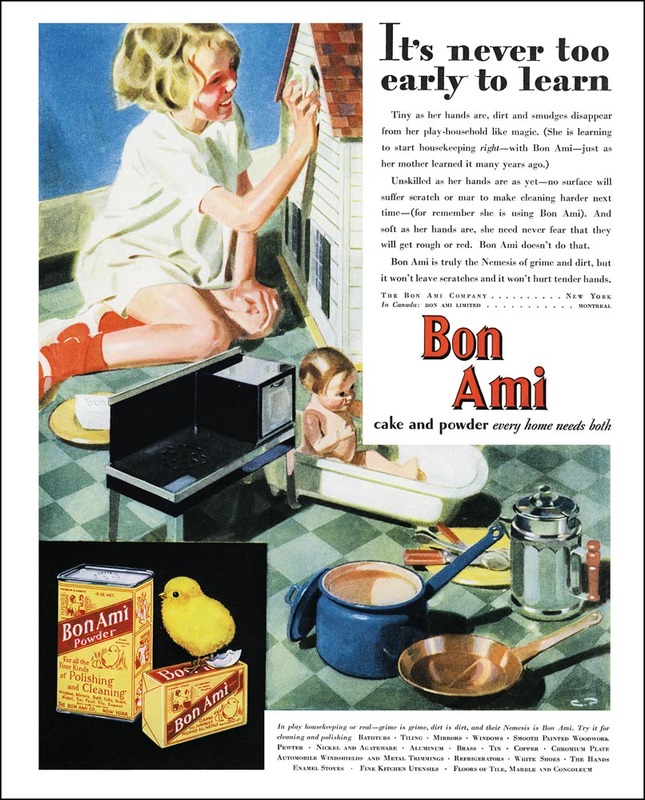 The earliest ads featuring our little chick started with the realism of the Ben Austrian lithographs. 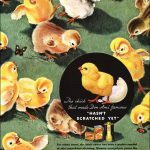 His barnyard and woodland images were a comfort to an increasingly urbanized America. 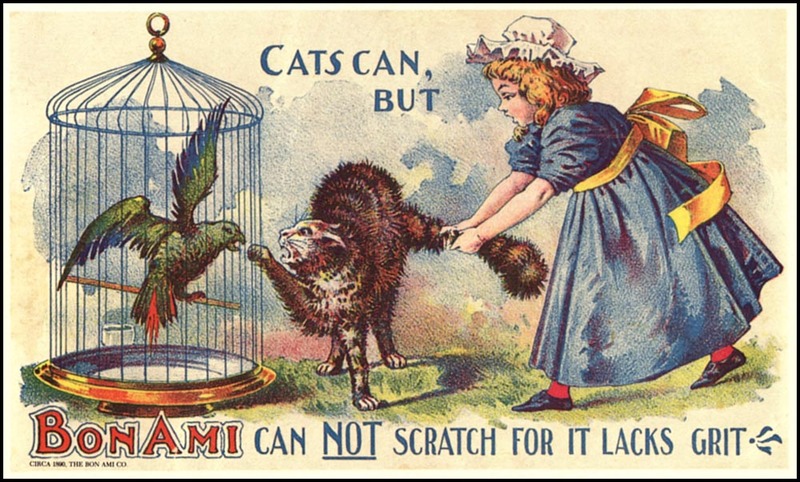 The art was realistic. 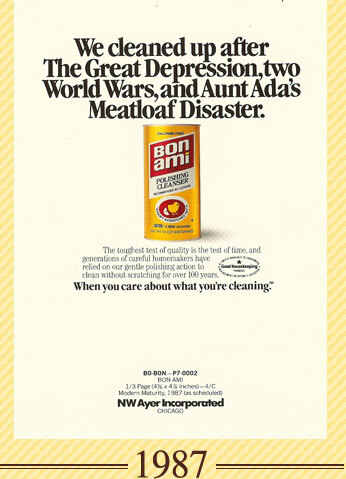 So was the tag line. 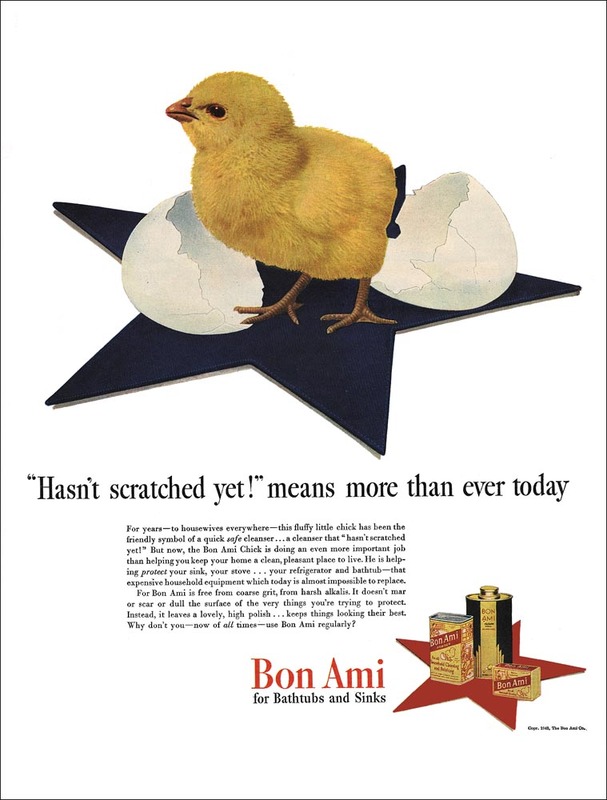 They couldn’t predict the future, but they could say this: Hasn’t scratched yet! 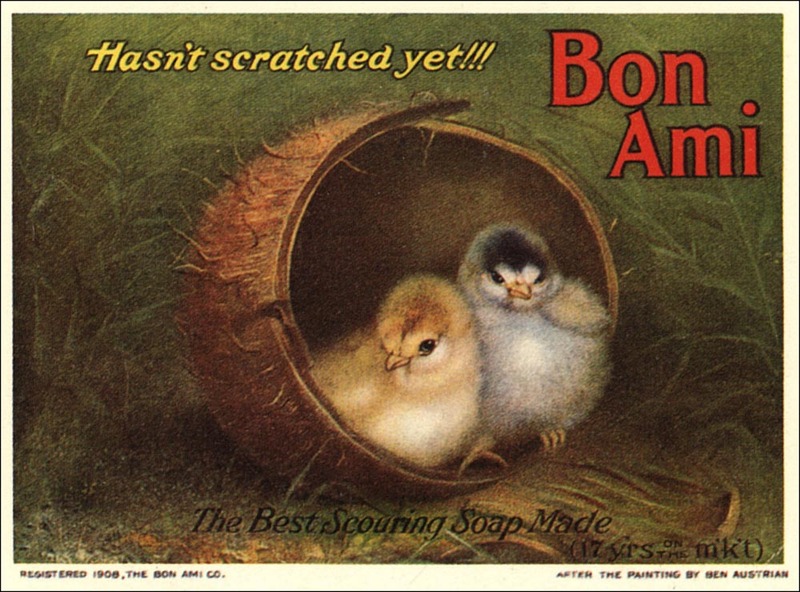 The chick is still there, but only in the background. 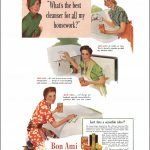 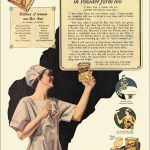 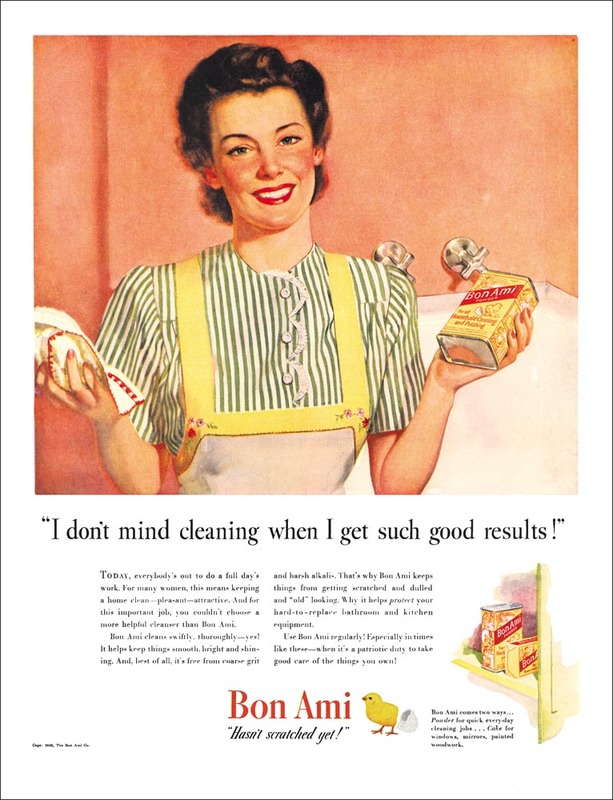 In the decade when women gained the right to vote, cleaning was still women’s work. 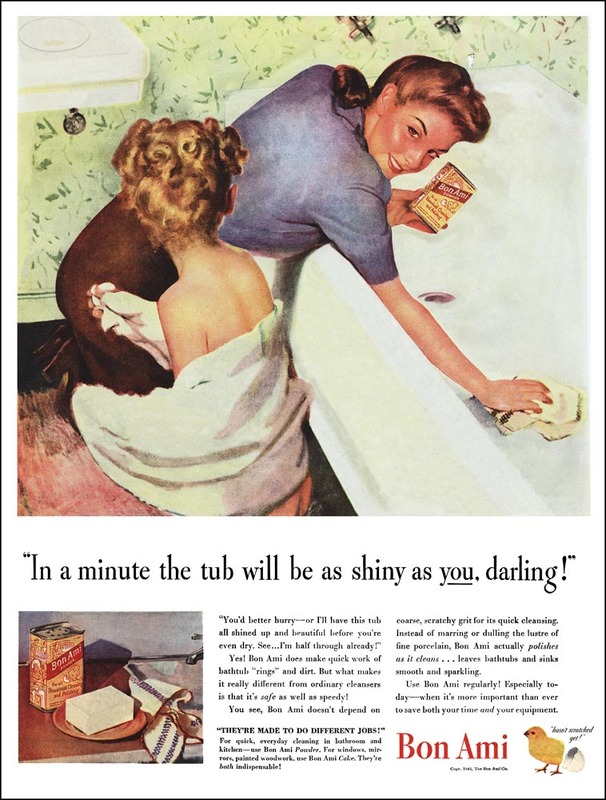 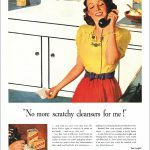 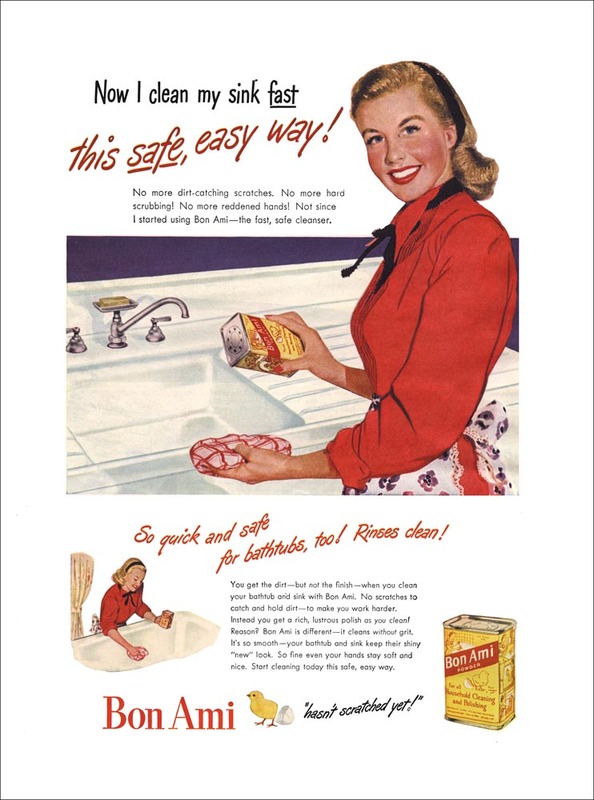 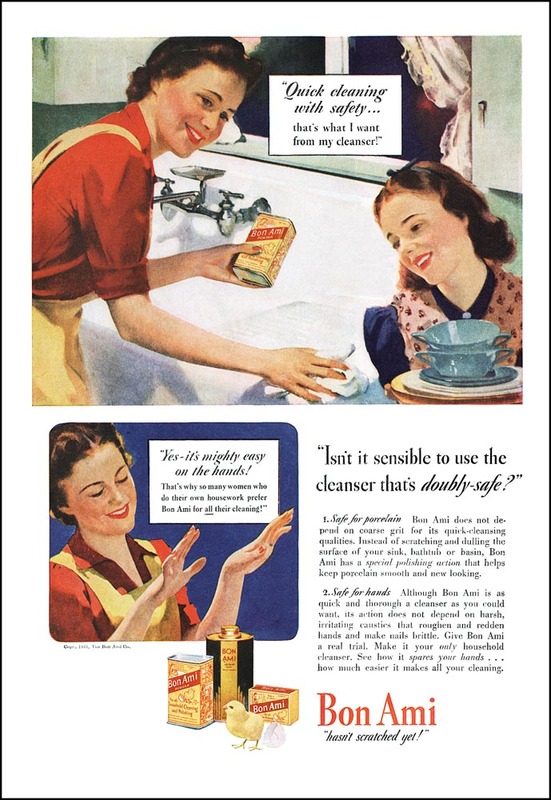 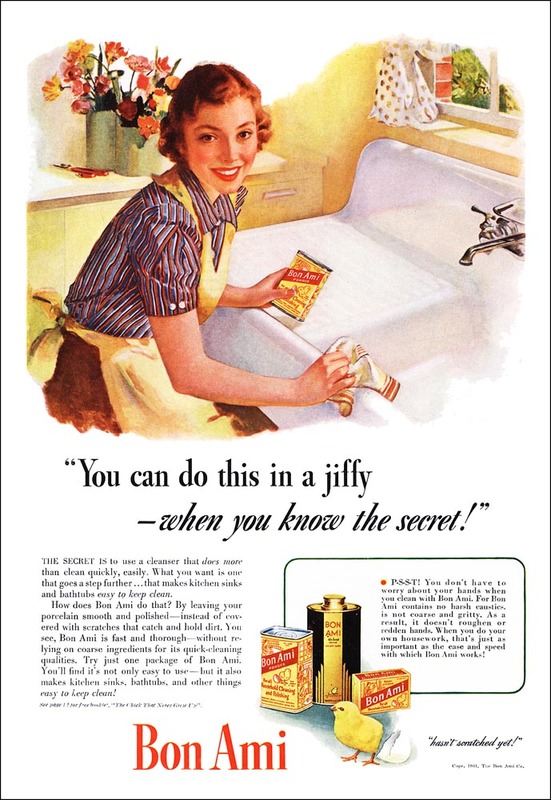 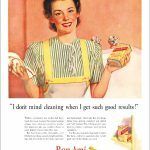 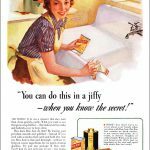 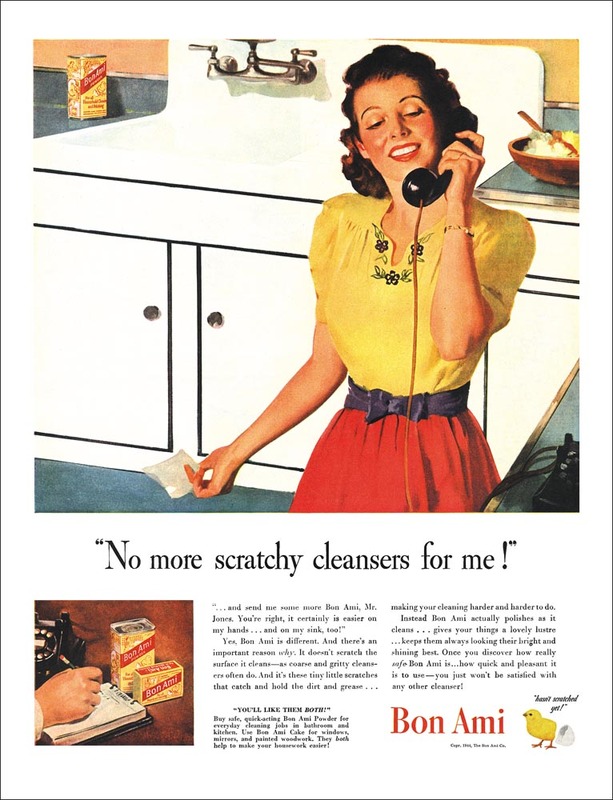 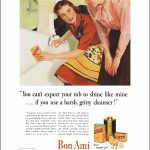 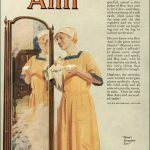 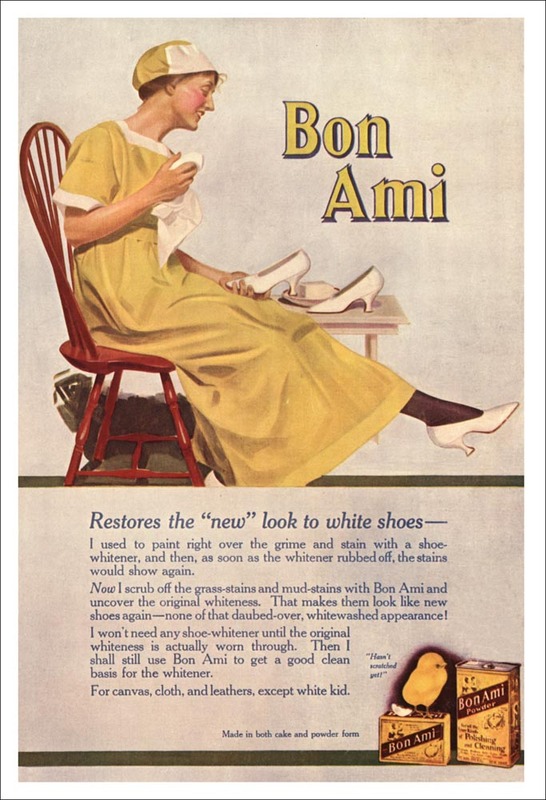 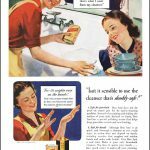 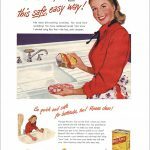 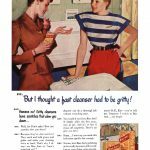 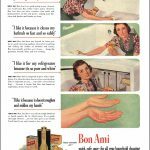 But the ads started to show women wanting something of their own cleaned, and getting help from others. 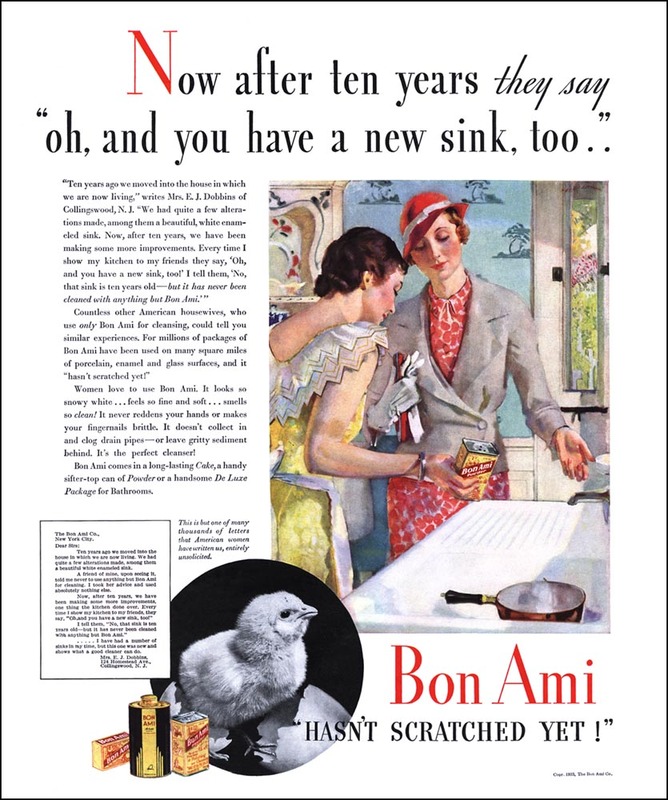 When no one had any money or anything new, at least you could make it look like you had a new sink! 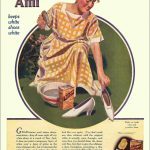 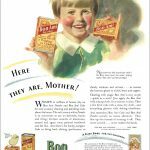 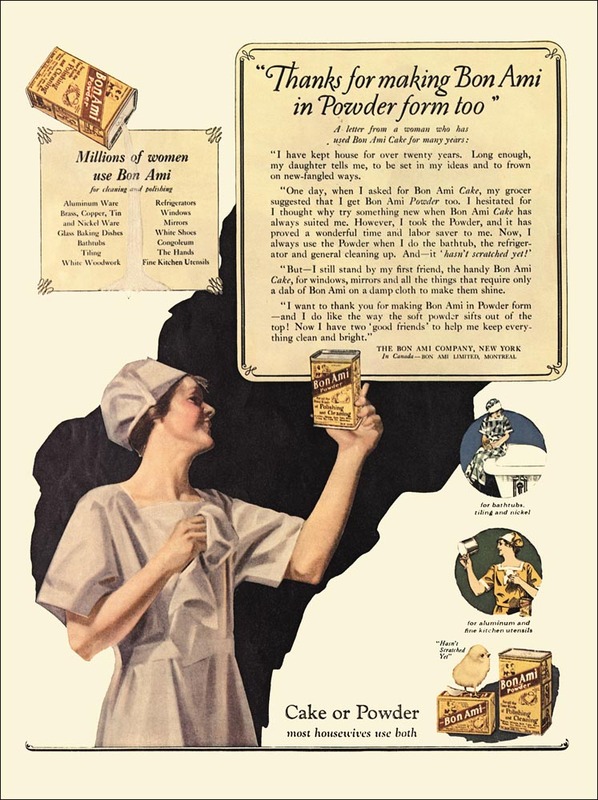 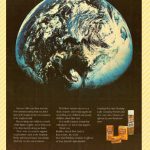 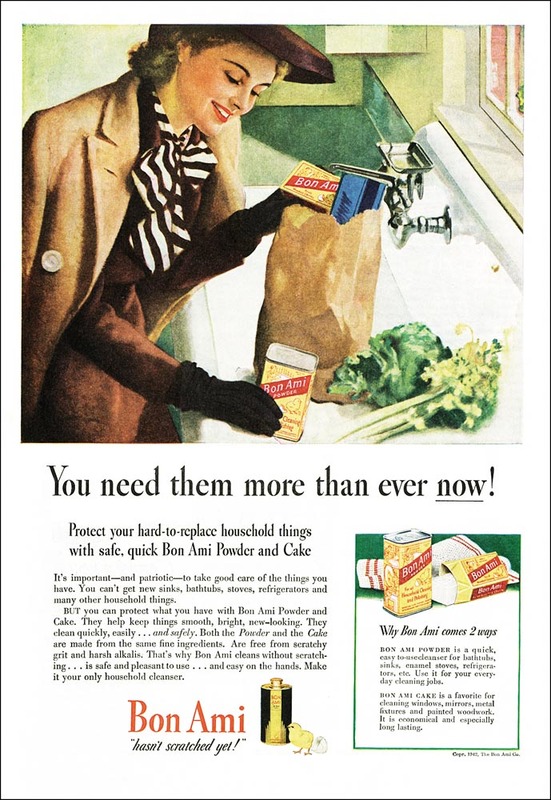 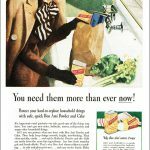 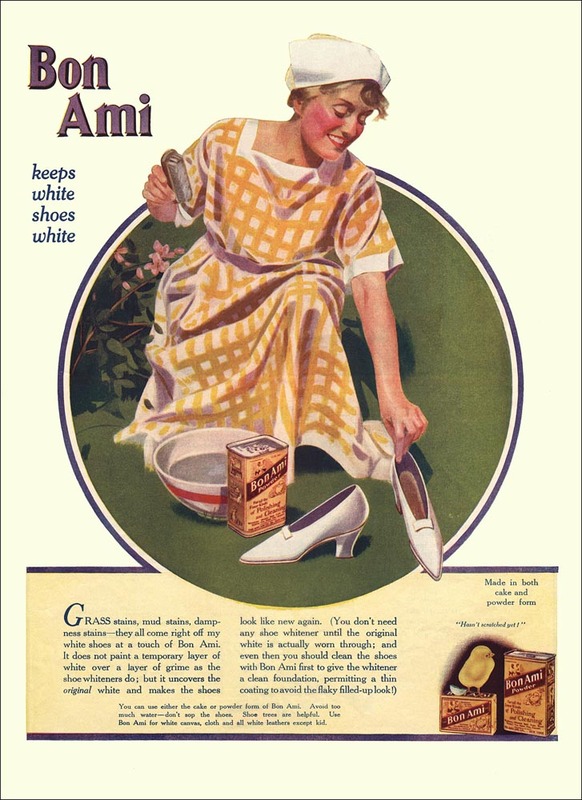 It was an era of Make-Do, and the ads showed people chipping in to help each other. 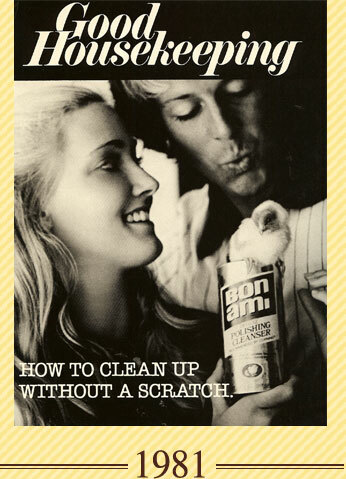 Even Dad helped, though he was a bit confused. 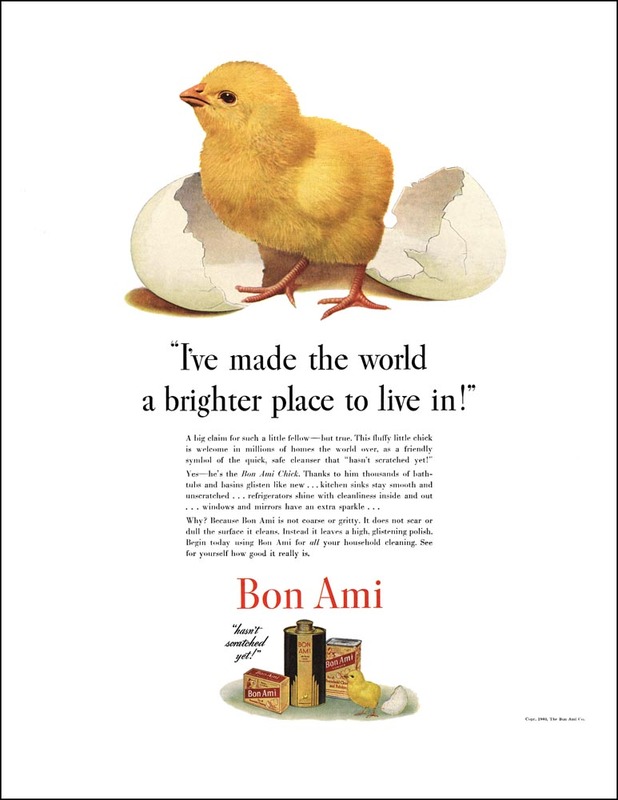 And there is our chick – in 1940, when all the headlines describe a world careening toward war – able to say, “I’ve made the world a brighter place to live in! 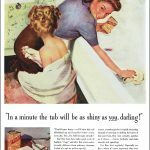 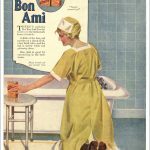 These ads show women from a unique perspective: The artist is at full height, and we see women leaning over a tub or reaching into a sink. 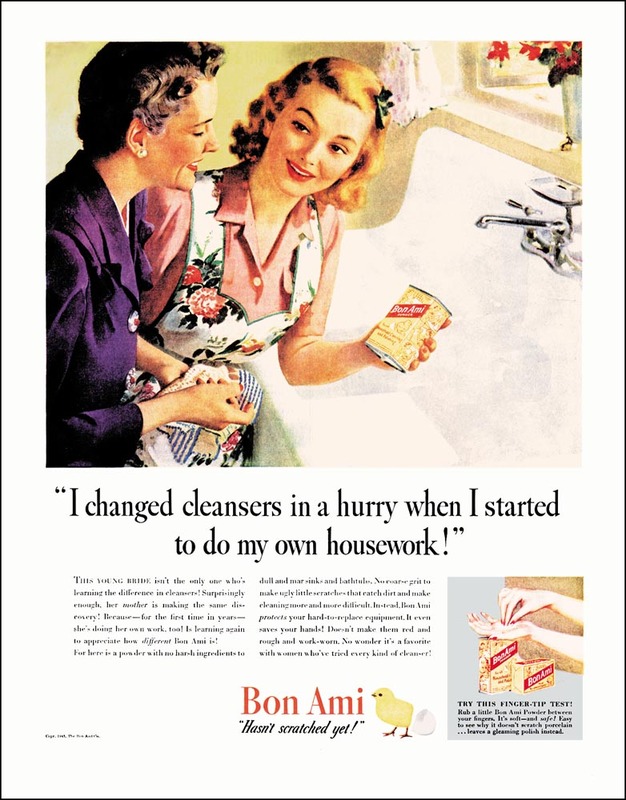 It’s work, and the women do it cheerfully. 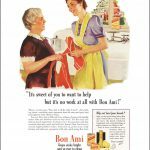 The men are away at war, and we see women helping each other, teaching each other. 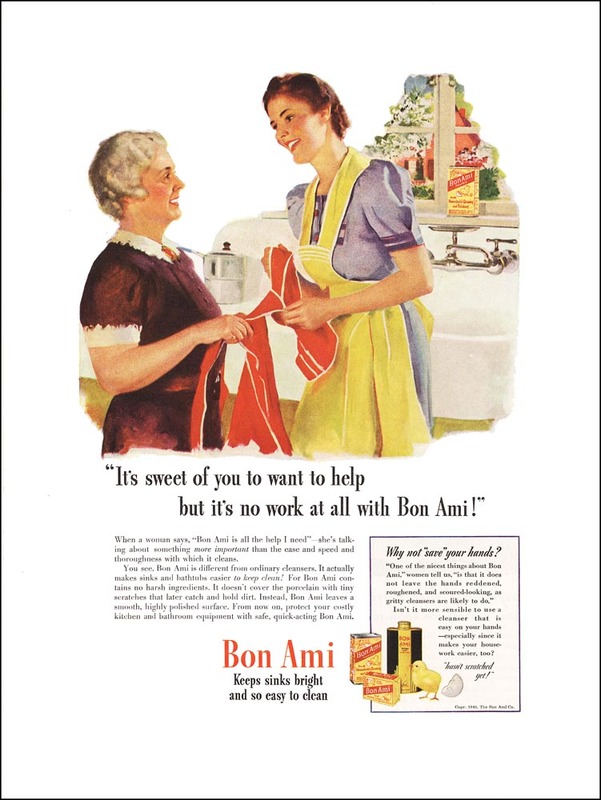 Mothers, daughters, grandmothers, friends – they lean in to offer advice. 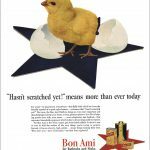 And there is the chick, in patriotic glory, taking her first steps on a bright blue star. 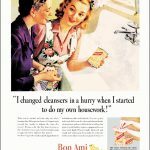 The men are home. 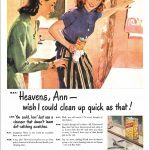 And the women still do the cleaning. 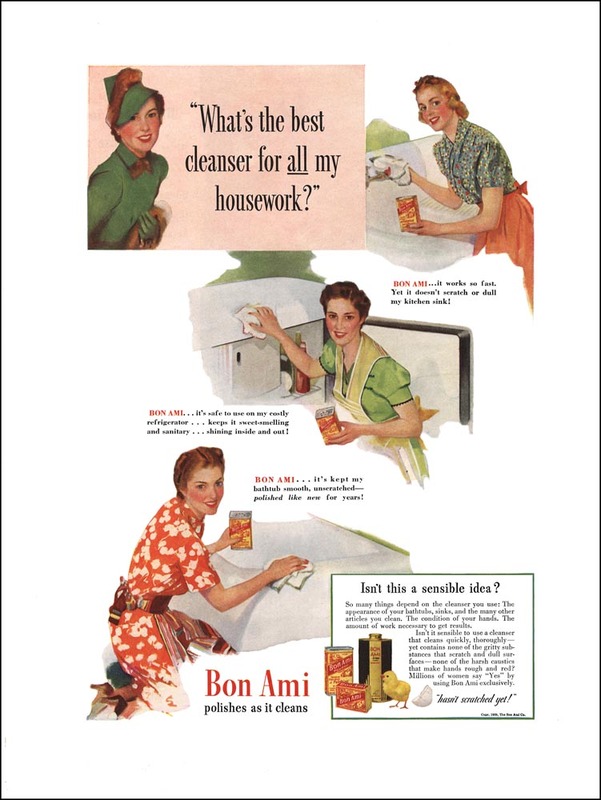 The women are busier now – they want cleaning done in a hurry – and at least some of the husbands are impressed by the new efficiency. 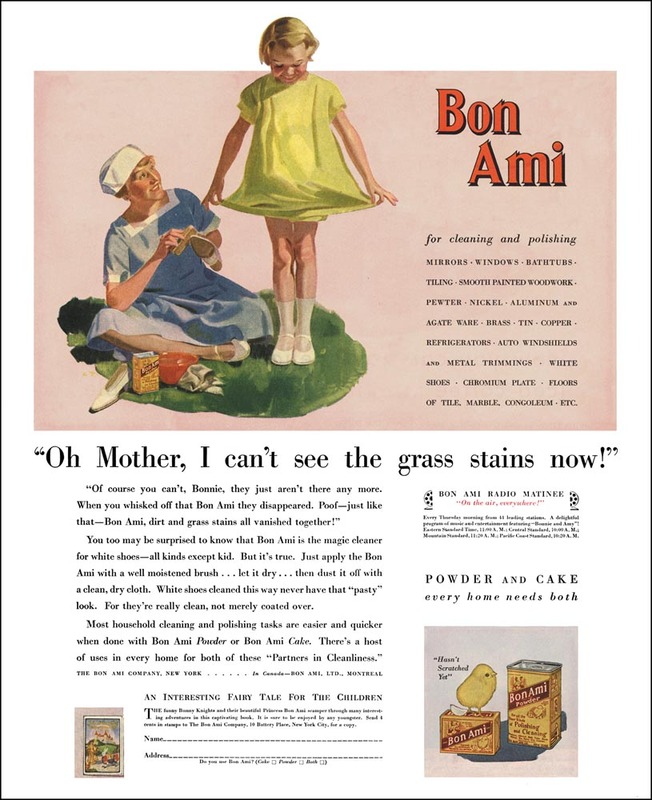 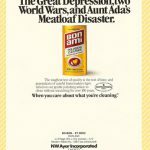 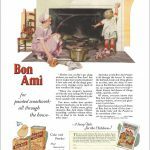 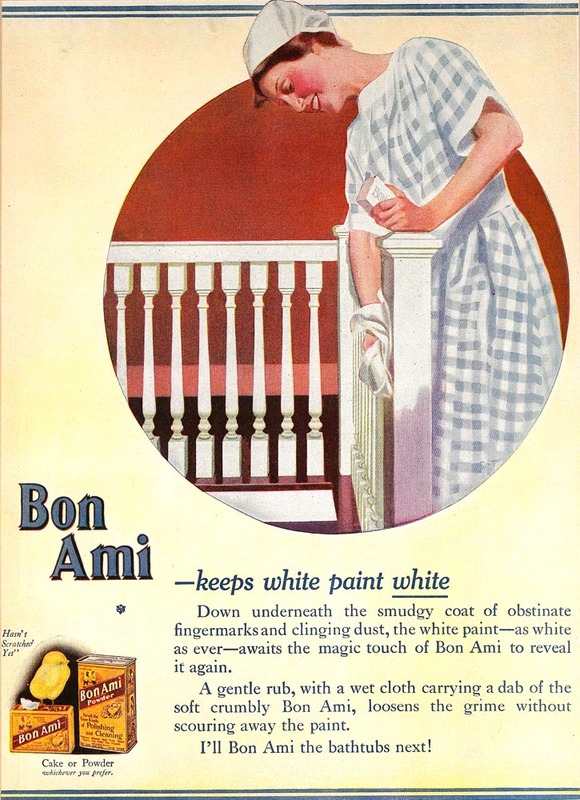 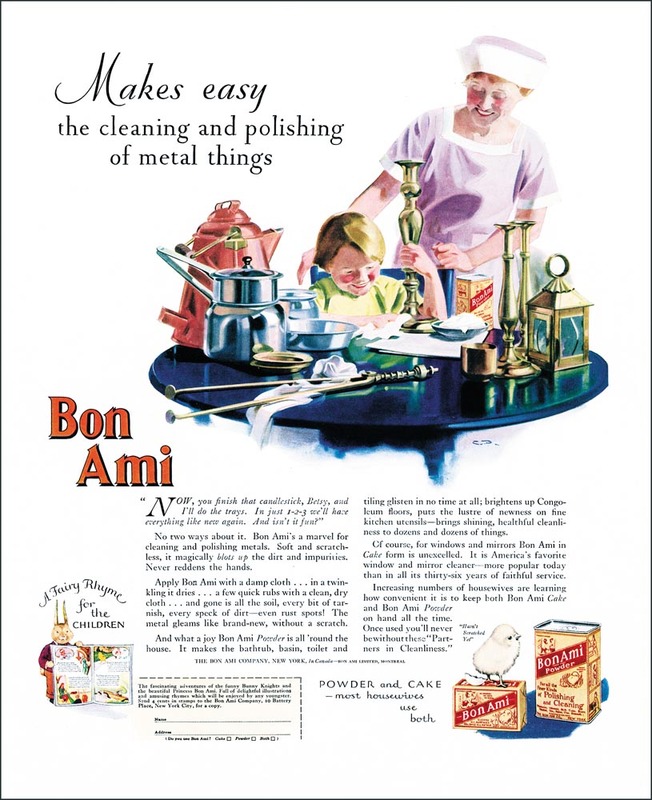 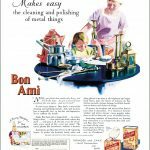 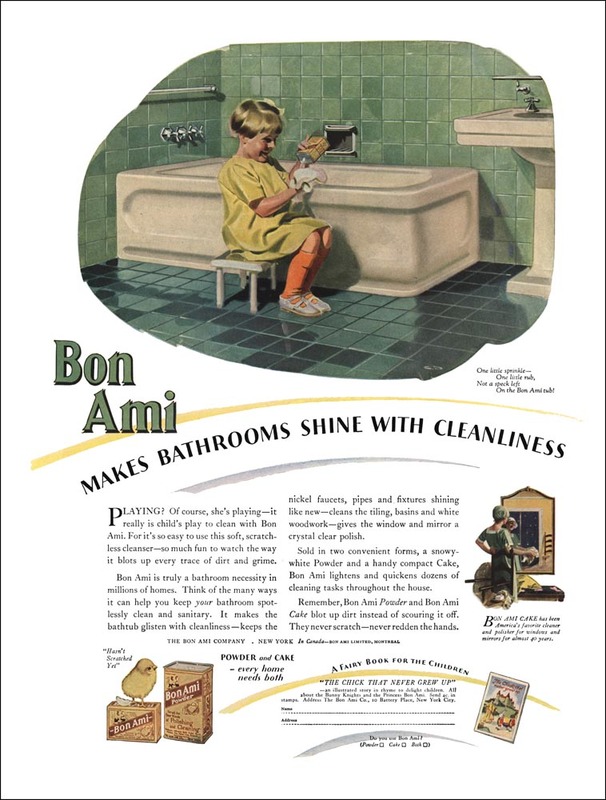 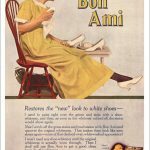 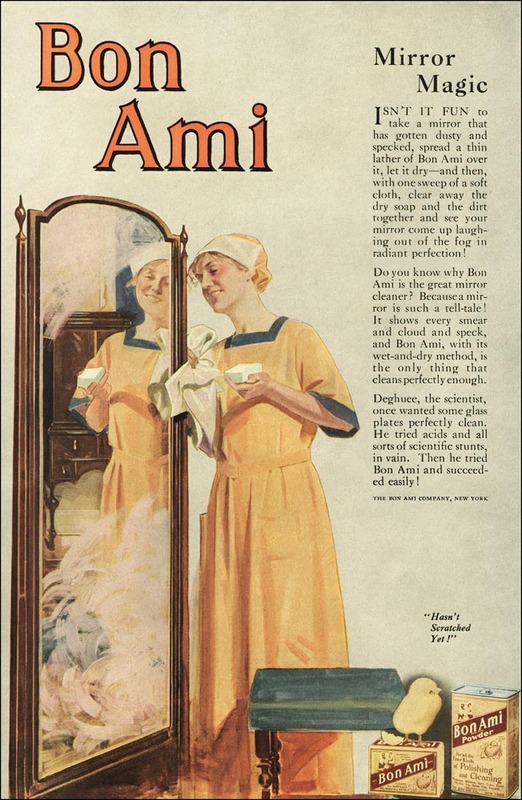 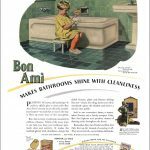 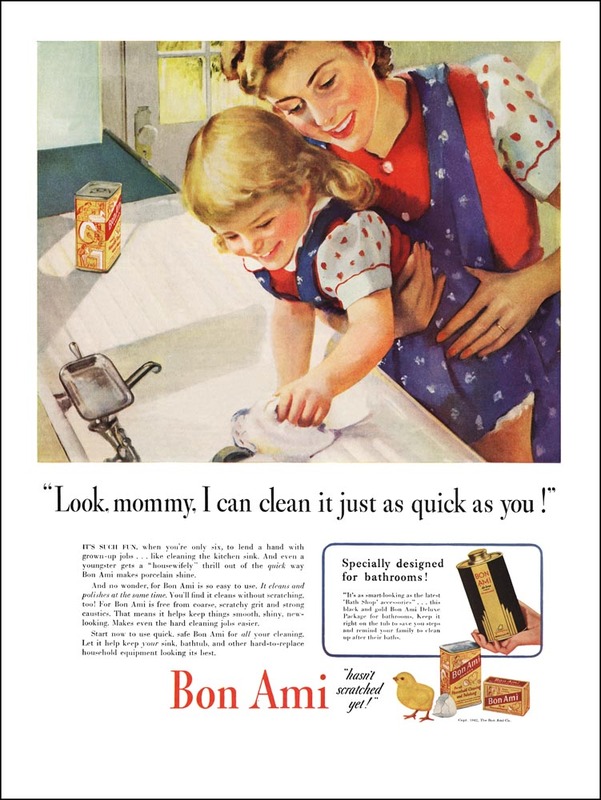 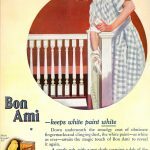 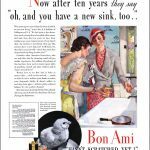 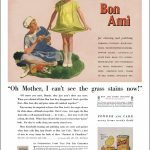 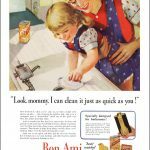 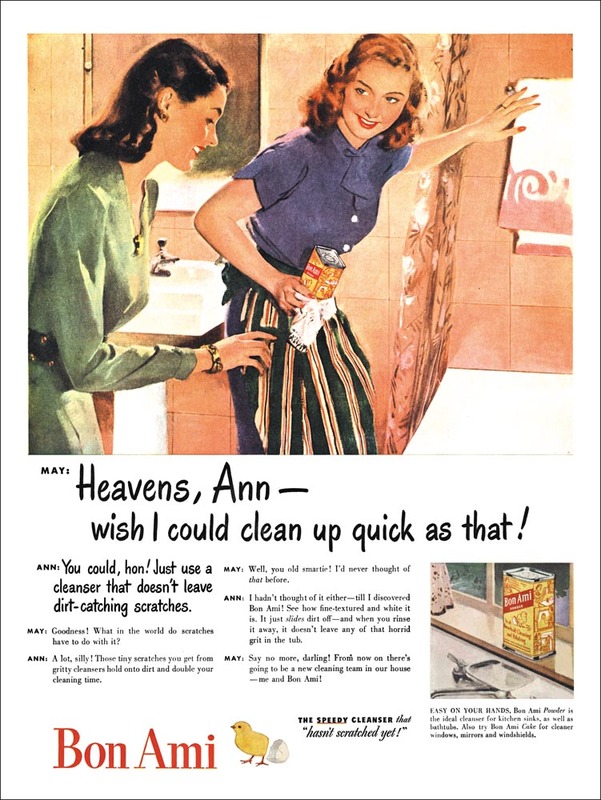 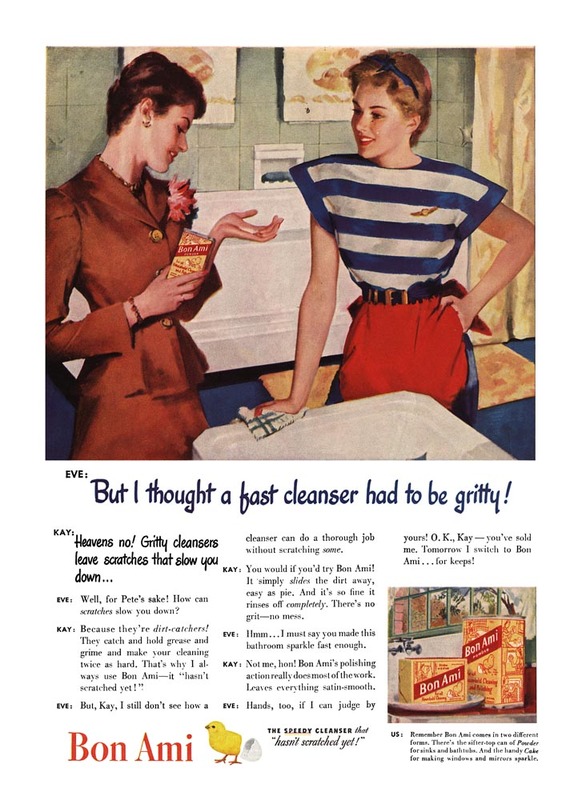 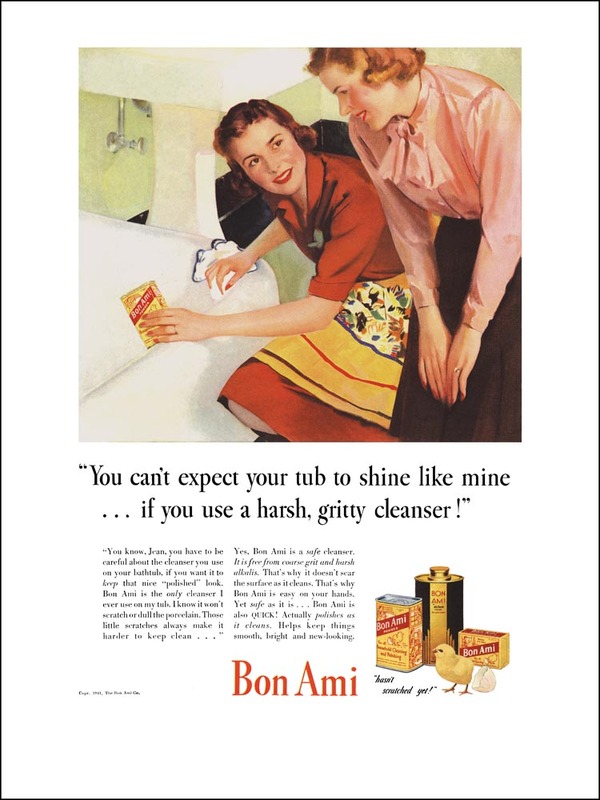 One of the ads shows domestic tension: Bill is angry that Ann is stopping to clean right then, and we get a glimpse, perhaps, that coming home isn’t always easy. 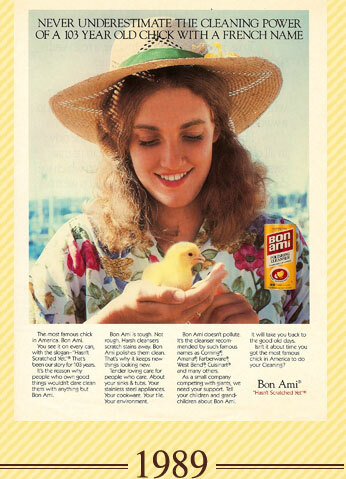 The chick returns as a scholar – perhaps reflecting a national commitment to math and science!